Reprogramming allows us to turn any cell of the body into a pluripotent stem cell. Its discovery in 2006 surprised many scientists and changed our thinking about how cells work. Reprogramming has opened up exciting possibilities for studying and treating disease. Embryonic stem cells (ESCs) were thought to be the only source of pluripotent cells until Kazutoshi Takahashi and Shinya Yamanaka in 2006 showed that skin cells can be reprogrammed into ‘induced’ pluripotent stem cells (iPSCs) by artificially adding four genes. Researchers have been excited by the opportunities iPSCs offer for studying, treating and potentially curing diseases. iPSCs also avoid several moral issues that accompany the use of ESCs. iPSCs offer researchers an excellent way to create and study diseased cells that contain the same genetics as patients. 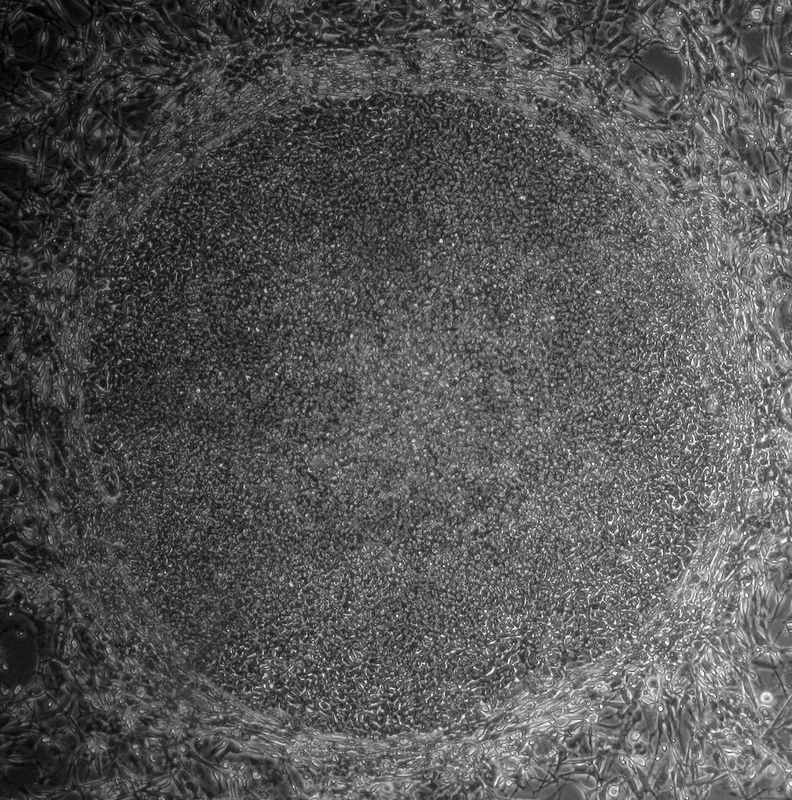 Researchers are constantly working to better understand how cell reprogramming works in order to develop better methods for controlling stem cell differentiation. iPSCs are being used to study and develop treatments for many diseases, such as a way to replace cells destroyed by diseases. Genetic errors that cause diseases vary from patient to patient. Bespoke treatments to fix patient’s specific genetic problems could be possible using iPSCs. Additionally, transplantations of iPSCs will not be rejected by patients’ immune systems because iPSCs are created from a patient’s own cells. Several studies show that iPSCs and ESCs often function differently, likely because iPSCs are not truly ‘100%’ reprogrammed. Researchers are still determining the effect of these differences on research and medicine. Technical challenges and our still limited understanding of iPSCs make it difficult to control stem cells and how cells made from iPSCs will behave in the body. Although medical treatments using customised iPSCs may sound attractive, developing affordable and effective iPSC treatments remains a very large challenge. In 2006, Shinya Yamanaka made a groundbreaking discovery that would win him the Nobel Prize in Physiology or Medicine just six years later: he found a new way to ‘reprogramme’ adult, specialized cells to turn them into stem cells. These laboratory-grown stem cells are pluripotent – they can make any type of cell in the body - and are called induced pluripotent stem cells, or iPS cells. Only embryonic stem cells are naturally pluripotent. Yamanaka’s discovery means that theoretically any dividing cell of the body can now be turned into a pluripotent stem cell. So how are these iPS cells made? Yamanaka added four genes to skin cells from a mouse. This started a process inside the cells called reprogramming and, within 2 – 3 weeks, the skin cells were converted into induced pluripotent stem cells. Scientists can now also do this with human cells, by adding even fewer than four genes. This short clip introduces the science behind reprogramming. View the full 16-minute film to see the whole story of Shinya Yamanaka's discovery. IPS cells and embryonic stem cells are very similar. They are self-renewing, meaning they can divide and produce copies of themselves indefinitely. Both types of stem cell can be used to derive nearly any kind of specialized cell under precisely controlled conditions in the laboratory. Both iPS cells and embryonic stem cells can help us understand how specialized cells develop from pluripotent cells. In the future, they might also provide an unlimited supply of replacement cells and tissues for many patients with currently untreatable diseases. In contrast to embryonic stem cells, making iPS cells doesn’t depend on the use of cells from an early embryo. Are there any other differences? Current research indicates that some genes in iPS cells behave in a different way to those in embryonic stem cells. This is caused by incomplete reprogramming of the cells and/or genetic changes acquired by the iPS cells as they grow and multiply. Scientists are studying this in more detail to find out how such differences may affect the use of iPS cells in basic research and clinical applications. More research is also needed to understand just how reprogramming works inside the cell. So at the moment, most scientists believe we can’t replace ES cells with iPS cells in basic research. An important step in developing a therapy for a given disease is understanding exactly how the disease works: what exactly goes wrong in the body? To do this, researchers need to study the cells or tissues affected by the disease, but this is not always as simple as it sounds. For example, it’s almost impossible to obtain genuine brain cells from patients with Parkinson’s disease, especially in the early stages of the disease before the patient is aware of any symptoms. Reprogramming means scientists can now get access to large numbers of the particular type of neurons (brain cells) that are affected by Parkinson’s disease. Researchers first make iPS cells from, for example, skin biopsies from Parkinson’s patients. They then use these iPS cells to produce neurons in the laboratory. The neurons have the same genetic background (the same basic genetic make-up) as the patients’ own cells. Thus scientist can directly work with neurons affected by Parkinson’s disease in a dish. They can use these cells to learn more about what goes wrong inside the cells and why. Cellular ‘disease models’ like these can also be used to search for and test new drugs to treat or protect patients against the disease. Reprogramming holds great potential for new medical applications, such as cell replacement therapies. Since iPS cells can be made from a patient’s own skin, they could be used to grow specialized cells that exactly match the patient and would not be rejected by the immune system. 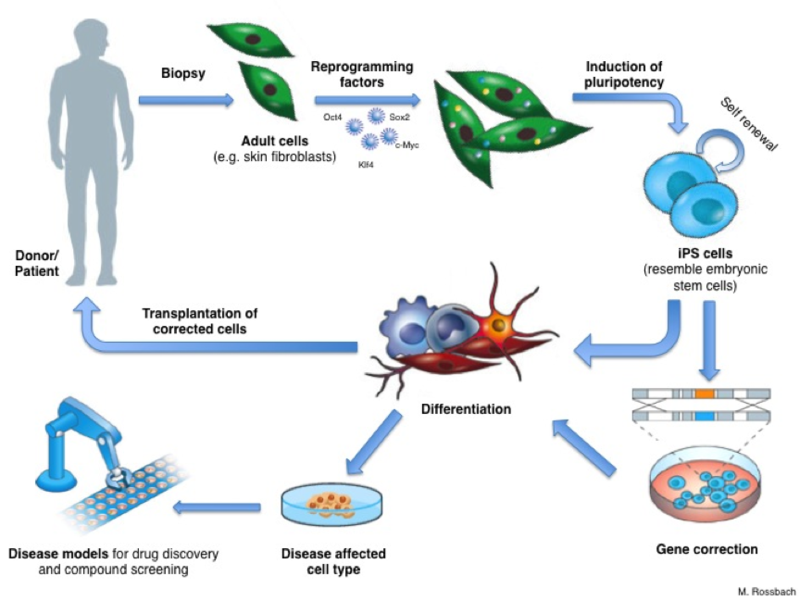 If the patient has a genetic disease, the genetic problem could be corrected in their iPS cells in the laboratory, and these repaired iPS cells used to produce a patient-specific batch of healthy specialized cells for transplantation. But this benefit remains theoretical for now. Until recently, making iPS cells involved permanent genetic changes inside the cell, which can cause tumours to form. Scientists have now developed methods for making iPS cells without this genetic modification. These new techniques are an important step towards making iPS-derived specialized cells that would be safe for use in patients. Further research is now needed to understand fully how reprogramming works and how iPS cells can be controlled and produced consistently enough to meet the high quality and safety requirements for use in the clinic. This factsheet was created by Manal Hadenfeld, updated in 2012 by Michael Peitz and Annette Pusch and reviewed by Oliver Bruestle. Shinya Yamanaka photograph by Rubenstein. Additional images by Michael Peitz, Johannes Jungverdorben and Michael Rossbach. Within 3 weeks you can generate a pluripotent stem cell from any cell of the body, even using cells from an 82 year old. ...can be reprogrammed back to pluripotent cells, marked here in green.